Orlando offers something for every schedule and every interest. With so much to do in Orlando and the surrounding area, it is important to do a little research and and planning prior to your arrival. VisitOrlando can help you make the most of your visit. Book restaurant reservations early. The more popular restaurants can book months out. Crowd Calculator - Some parks have busier days than others. We find this crowd calculator be to be a helpful tool. It suggests which parks may be the better choice on specific days. Special Tickets - Take advantage of the "After 1:00 pm" and "Twilight Hours" theme park tickets. Crowds also seem to thin out later in the evening, especially after the last fireworks, parade or light show of the day. Not interested in Disney? Be sure to check out International Drive. There are plenty of restaurants and shops to explore. Special Offer: Conference attendees may purchase discounted theme park tickets. These tickets are only available to conference attendees. 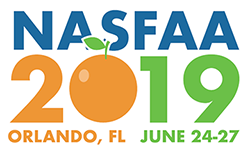 Tickets may be purchased in advance online or you may visit the Disney ticket sales desk in the hotel lobby and show your NASFAA conference badge to purchase. Discounted tickets must be purchased by June 19 and cannot be purchased at theme park gates. After 1:00 pm Park Ticket - Admission to one Walt Disney World Theme Park after 1:00 pm for one day. Twilight Hours Park Ticket - Admission to Walt Disney World Theme Park after 5:00 pm for one day. You may also utilize the Disney Tickets desks at the hotel (located in the lobbies of both the Swan and Dolphin wings) to purchase other theme park tickets and make restaurant reservations. If you're interested in setting up your Disney FastPass+ prior to the conference, please contact our housing partner Orchid to send your reservation information over to the hotel and you can then link your hotel reservation to your MyDisneyExperience account. Below are some tips to help make your travel to and from Orlando, and your travel around the city, as seamless as possible. Mears is the preferred service provider for transportation for the Walt Disney World Swan and Dolphin. Make your transportation reservations online. Complimentary buses depart from the front entrance of the Swan wing and the Dolphin wing to the Magic Kingdom® Park, Disney's Animal Kingdom® Theme Park and all other venues, including Disney Springs, approximately every 20-25 minutes. Water taxis take guests to Disney's BoardWalk, the Disney's Hollywood Studios™ and Epcot® approximately every 20-25 minutes, starting 1 hour before the parks open*. You will be able to board the water taxi from the boat dock located by the covered walkway between the Swan and Dolphin wings. *Park hours do change. Please check with one of the Disney Desks (located in the lobbies of both the Swan and Dolphin wings) for the operating hours of the park you are visiting. The same schedule applies to the return routes from the parks to the Walt Disney World Swan and Dolphin. You should inquire inside the park you are visiting where the transportation you will be using is located. Buses continue to run one hour after parks close. Use the convenient trolley to get you where you want to go along the strip.